Grosset & Dunlap, c1924, no other printings, 246 pgs + ADS for the Bobbysey Twins & MORE… ends with Tom Swift & His Great Oil Gusher. VERY GOOD Condition Hardcover. This book has very light cover speckling, light spine sunning with speckles, & tiny name on fep. Pages & Binding are NICE & TIGHT with Picture Plates! 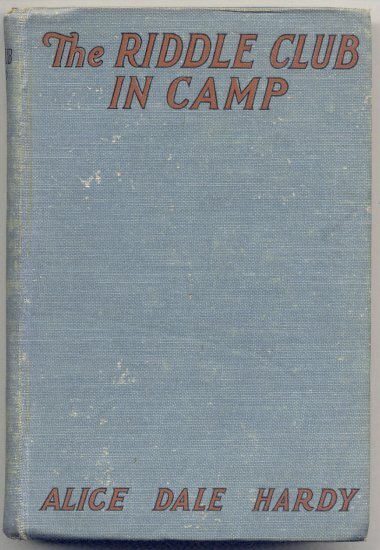 In this 2nd book of the Riddle Club book series, the club members went into camp on Edge Beautiful Lake. Here they had a rousing & good time. As they were swimming, boating & around the campfire, they fell in with a mysterious old man known as “The Hermit of Triangle Island”. Nobody knew His real name, nor where he came from until the propounding of a riddle solved these perplexing questions. Buyer pays Shipping. **Payment must be received within 10 days of the end of the auction, unless other arrangements are made. Checks held till clear. Money Orders & Paypal Payments shipped on receipt. Buyer Must Request Insurance at Additional Expense. IL residents Must add Sales Tax.